Kevin Barbee & Vickie Barbee with CFII Paul Hesse. Mother and son soloed on Kevin's 16th birthday. This was one very special day for Empire Aviation’s Flight School and the Henderson-Oxford Airport in North Carolina where Kevin Barbee and his mother, Vickie, have been taking flying lessons. Thursday, May 6, 2010 was Kevin’s 16th birthday. Not only was he ready for his first solo flight, but he was (finally) legal to do so. That in itself is exciting … but wait … it turns out his mother Vickie was ready to solo as well! 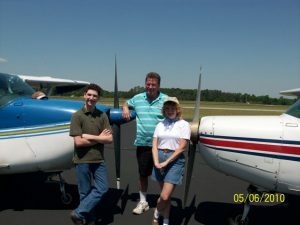 Is there a phrase “the family that solos together, stays together?” Emotions and nerves were running high, but both mother and son flew beautifully, Kevin in the Cessna 172 and Vickie in the Cessna 152. Kevin and Vickie were featured in the July issue of General Aviation News. Click here to read the article.